Guess what showed up at my door yesterday? Some Charming Travelers. It's a set of 56 5 inch charms that started with From Blank Pages and has been all over the US and Canada (ok, not quite all over Canada yet). Want to see exactly where this (the blue pack) has been? Check it out at the travel log on From Blank Pages. When you win the charms, you can take as many as you want then replace them (the pack must have minimum 56 5 inch charms when it leaves you!). Make sure you follow the golden rule and add back things that you think others would like and are of good quality. You want the Travelers to be as nice for someone else as they were for you! 1. Must be an active blogger (so you can have a giveaway to keep the Travelers moving). 3. Must be willing to have fun! So if you can meet those requirements then enter the giveaway (details about that after the pictures!). Of course, before you decide to host the Travelers you need to check them out a bit more, right? Here is what I took from the bundle (hee hee, have to tease you with what you can't have. . .I can be cruel like that!). I'm not sure how many folks will be heart broken over missing out on some of the weirdos I snagged. What? You're not lining up and rioting to get that koala charm? Or that feline tabloid charm (yes, it's like a cat tabloid with funny headlines--I grabbed that up without hesitation). I took a total of ten charms, eight of which I consider "pairs" which I plan to use together (like the cat tabloid and paw prints--go great together!). The two miscellaneous ones (that aren't really pairs) were the white with the blenders and the yellow with little puppies. Yes, I could pair them but that would be odd and mildy disturbing. 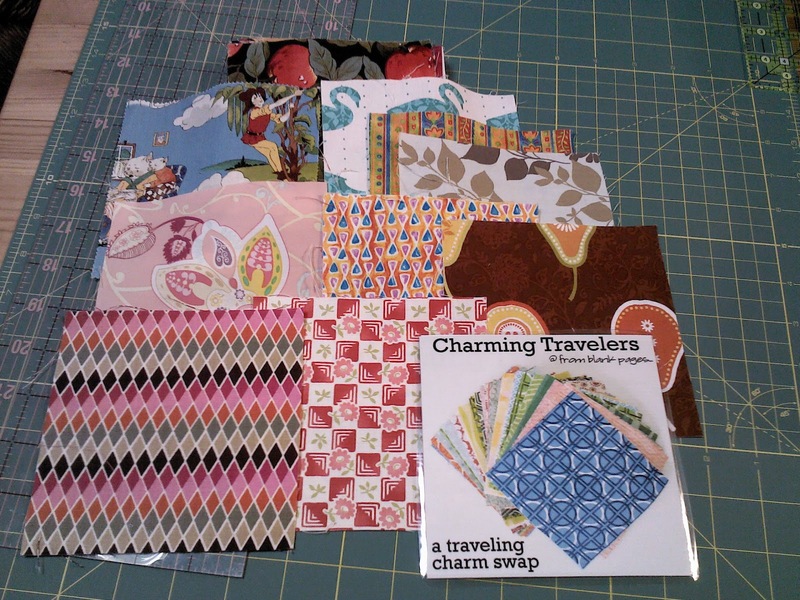 Want to see what I added to the Charming Travelers? I tried to add in colors/patterns that were lacking in the set and replenish the "weird" factor (I depleted it pretty well) and add a few that matched charms already in the set (like the apple trees go well with another apple fabric in the set). Ok, I'm done yapping about the charms. Time to get on to the giveaway rules. 1. Leave a comment on this post. If you need a prompt, tell me which charm you think is just TOO weird/ugly (from those pictured) that you would NEVER take. 2. Random name will be drawn Tuesday December 11. 3. Anonymous comments welcome but make sure you include an email address so you can be contacted. 4. Winner has 3 days to reply to "You Won" email. If they don't reply, another winner will be drawn from existing entries. Remember: This is open to US and Canada residents. Oh! This looks like fun! I would definitely enjoy participating. 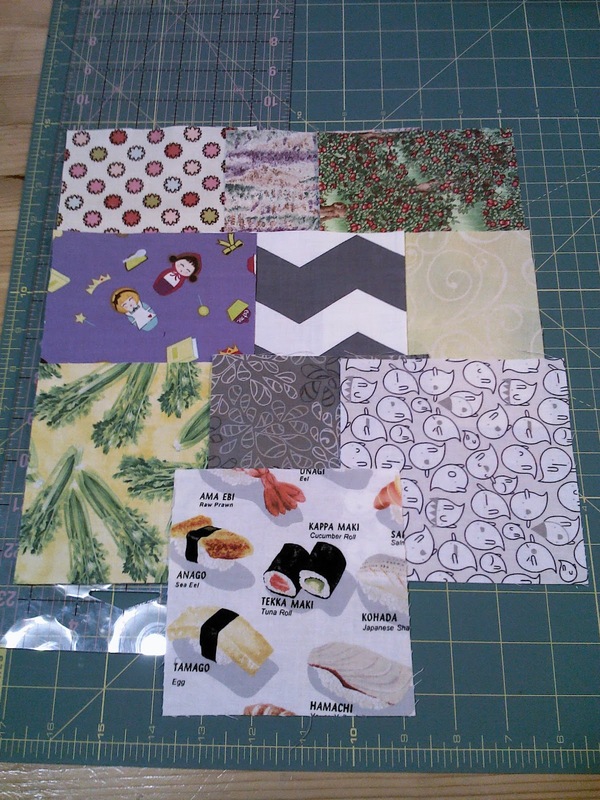 The Koala and celery are perhaps ones that I normally wouldn't take but I am currently collecting squares for an I-Spy blanket so I would probably have taken those lol! 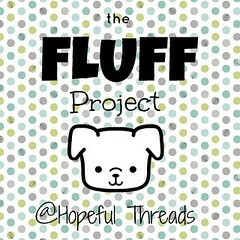 I stumbled upon your blog by clicking on your name on one of the sew-mama-sew giveaway pages :) Off to look around. I'd love to participate! I hate to be negative, but the koala print probably wouldn't float my boat, but I do love the blenders you got! This sounds like so much fun. Thanks for the chance to win. 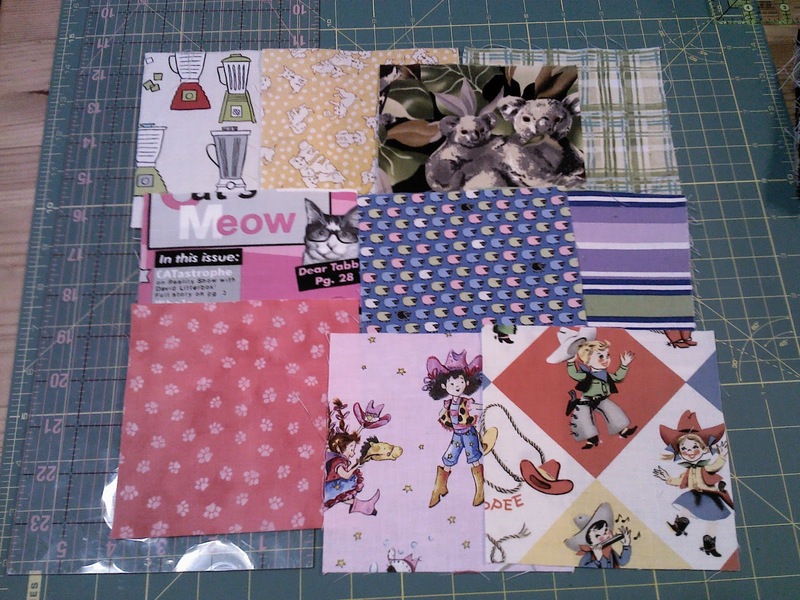 Update: Scrap Map of U.S.A.
For a Swap: Cutest Fat EVER.